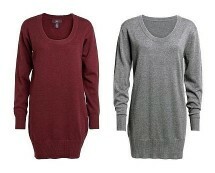 The ultimate must have items for colder wintery months have got to be the oversized knitted jumpers. 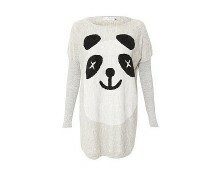 Knitted jumpers keep us cosy and snug yet they still look very cool. Bigger and baggier jumpers seem to be the hot new trend among girls at the moment because they are easy to wear and they offer a laid back approach in a very fashionable way. The big heart print design will help create a girly sweet and softer look to what otherwise could be known as a basic baggy jumper, and they are incredibly cute! The batwing detailing to the sleeves offers a more modern approach to oversized knits; for girls who like to look effortlessly stylish. To create a trendy street style of casual comfy wear; try pairing it with simple leggings or skinny jeans and lace up pumps, and allow the knit to slouch down on one shoulder; this look has ‘street style girl’ written all over it! 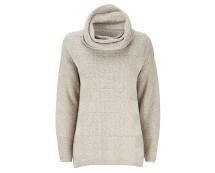 Stone knitted deep rib cowl neck tunic. Teamed with leggings to create a great A/W look. 53% Acrylic,23% Wool,13% Polyester,11% Lurex. Machine washable. Polo neck jumper in an oversized cut. Featuring ribbed neck, cuffs and hem. Made of 100% Acrylic.